Little one has decided that she would much prefer to have a hot lunch now rather than sandwiches which I am happy with as the weather is getting cooler. She has also been working on using a spoon and self feeding so I am trying to give her foods to encourage her to eat with cutlery. It’s still a little hit and miss but she is trying really hard and gets frustrated when I try to help, so mealtimes are becoming eventful! 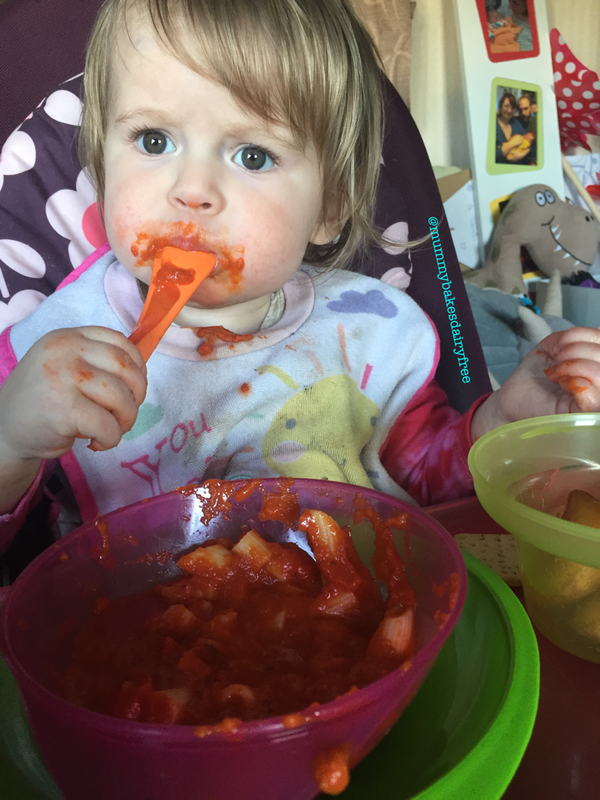 To add to the fun I thought I would introduce little one to soup… Soup, perhaps not my best idea! Well it wasn’t as messy as the first time she had a smoothie but I was glad it was bath day! My recipe for speedy tomato soup was largely influenced by what I had in my kitchen. It’s another flexible recipe which suits additions and substitutions. It is also perfect for hiding veggies and would suit having meat or pulses added to it for protein. My recipe only used a few ingredients and took less than half an hour to make. It really is a cheats soup. Plus you could double the quantities and freeze! 1. In a large saucepan soften the carrots and garlic in a splash of vegetable oil, over medium heat. 2. After a couple of minutes add the tinned tomatoes and mixed herbs and stir. Bring to the boil and then reduce and simmer for 10 to 15 minutes until the mixture thickens. Add a splash of boiling water if it reduces too much. 3. Using a stick blender and whiz the soup until smooth (or your desired consistency). Add a splash of boiling water if the soup is too thick. I seasoned mine and daddy’s portions afterwards. 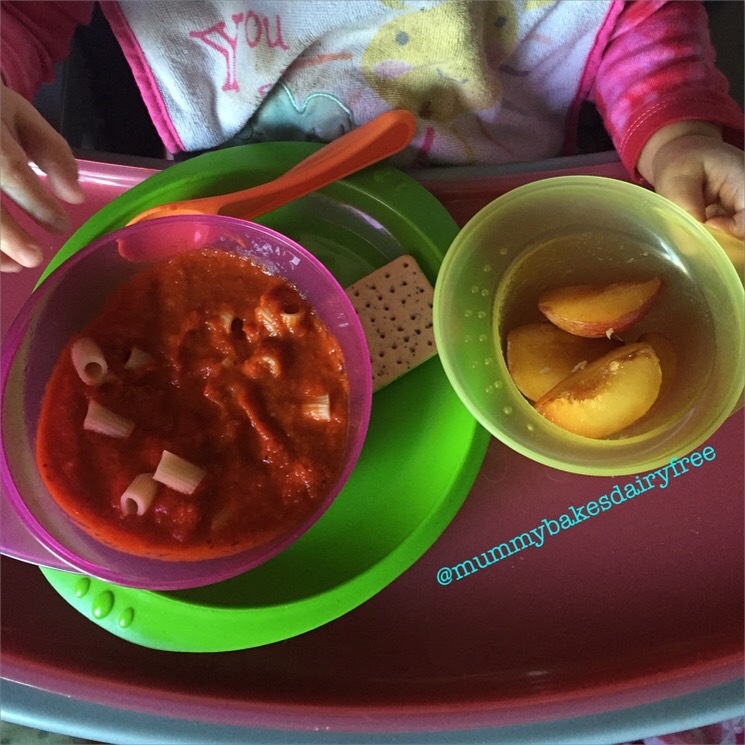 I added chopped rounds of pasta to give the soup texture and to help little one to use her spoon skills. Next time I may also added cooked chicken or chunks of vegetables. You could also use different herbs or spices to adapt the flavour. Dairy, egg, nut, soya and gluten free. Vegan.